Carol Lynn Petty was born March 18, 1945 in Cleveland, Ohio to E. Raymond and Wilma (nee Skinner) Curtis. She died February 28, 2019 at Northwest Community Hospital in Arlington Heights. Carol retired in 2003 after a 35-year career with United Airlines. She started with United in Cleveland, worked in Chicago, Los Angeles, and back to Chicago where she spent 15 years as an instructor in the Corporate Training Department. Her passion was teaching, and she delighted in following her former students’ successes. 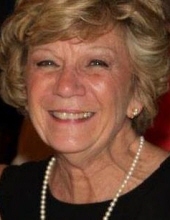 She was a long-time and active member of Congregational United Church of Christ in Arlington Heights. Carol and Roger moved to Mountain Home, Arkansas in 2010 where she was Agency Relations Coordinator at the Food Bank of North Central Arkansas and Adjunct Instructor at Arkansas State University. They moved back to Illinois in 2016. Carol is survived by her husband Roger L. Petty; her stepsons Russell (Amy Galpin) and Ryan (Amy), her grandchildren Brandon and Graham Petty; her sister in law Janice M. Curtis and by 18 nieces and nephews, 21 great nieces and nephews. She is preceded in death by her brother Stephan J. Curtis and by her parents. Memorial visitation Saturday, March, 9, 2019 from 1:00 PM until 5:00 PM at the Glueckert Funeral Home, Ltd., 1520 N. Arlington Heights Road, (4 blocks south of Palatine Road) Arlington Heights. A memorial Mass will be held at a later date. Interment private. In lieu of flowers, memorial contributions may be given to Congregational United Church of Christ, Arlington Heights or The Food Bank of North Central Arkansas, Norfork, AR. "Email Address" would like to share the life celebration of Carol Lynn Petty. Click on the "link" to go to share a favorite memory or leave a condolence message for the family.